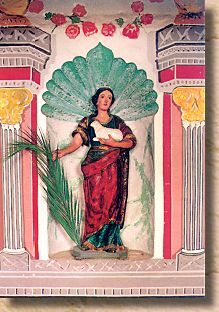 This statue of St. Agnes, dating from the 18th Century, is located in a niche above the main altar at Old Mission Santa Inés. Saint Agnes (Santa Inés) was a beautiful young Roman girl who had accepted Christianity early in life. When the son of a Roman governor sought her as his wife, she refused, stating that she was already betrothed - as she had dedicated her life and heart to Jesus. Furious at discovering her Christian faith, the Roman official commanded that she be forced to become a temple prostitute for the Roman pagan religion, and had her taken to a brothel where she was stripped. According to legend, her hair grew long enough overnight to cover her nakedness and protect her purity. The young man attempted to see her but was blinded; Agnes then prayed for him and his sight was miraculously restored. Because of these events, the people of the time viewed her as a sorceress, and she was brought out to be burned at the stake, but again the Lord protected her and the fire was miraculously extinguished. In 304 AD she was beheaded, and became one of the best known and most widely honored of the early Roman martyrs. Saint Agnes is the special patroness of bodily purity and chastity. Listen to a short video reflection about the sacrifice made by Saint Agnes by Father James Kubicki, SJ, please click here.